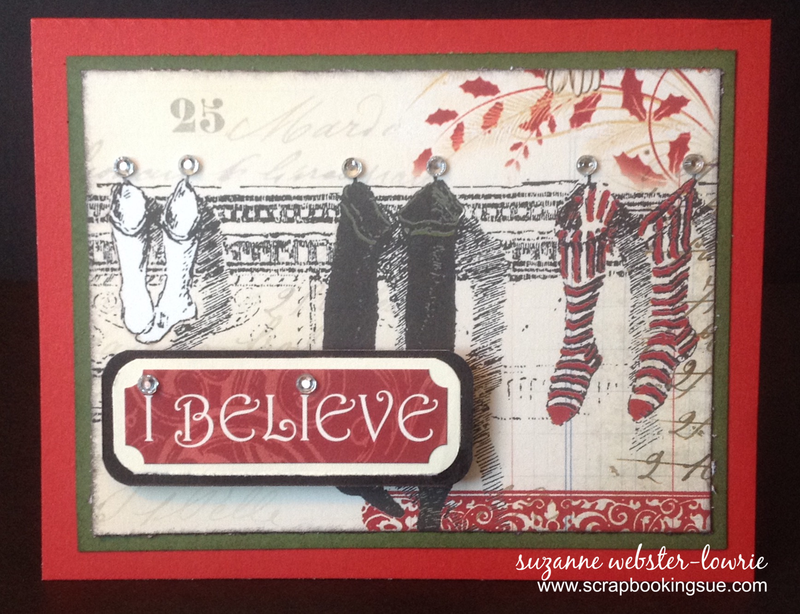 The other day, I featured a quick and easy card made with the Yuletide Carol Paper Packet and Yuletide Carol Complements (stickers). Since people seemed to like the ease of that card, I have another one to feature today. And… this one may even be quicker to put together! 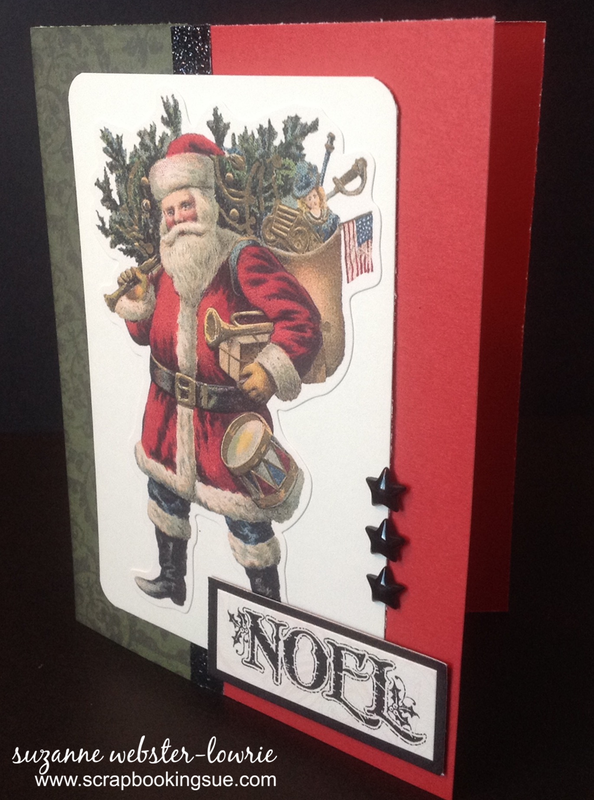 I used Cranberry cardstock to create a 4.25″ x 5.5″ card base. Then, I used New England Ivy cardstock as an overlay. 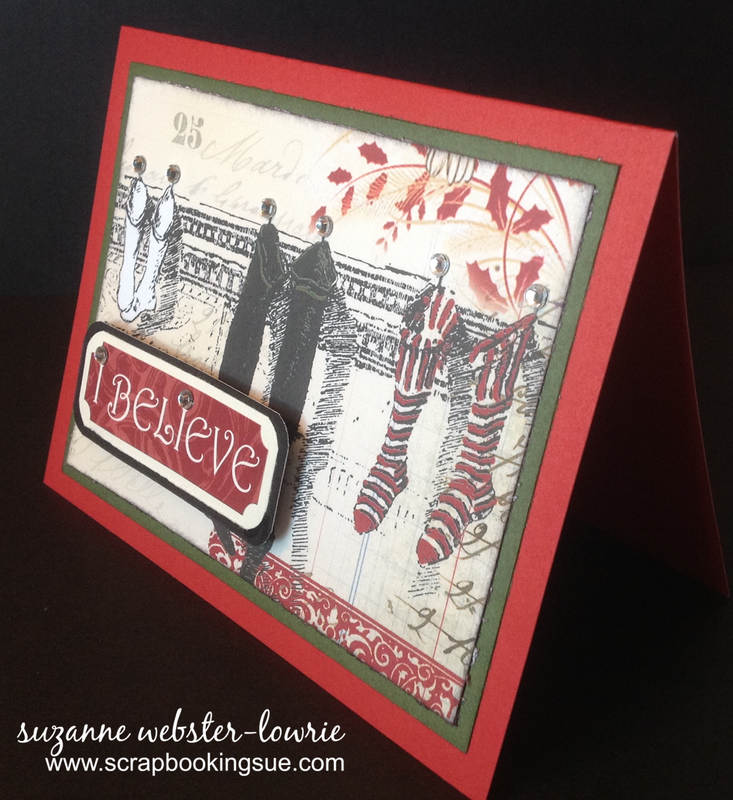 The background picture was actually just cut from a piece of patterned paper from the Yuletide Carol Paper Packet! 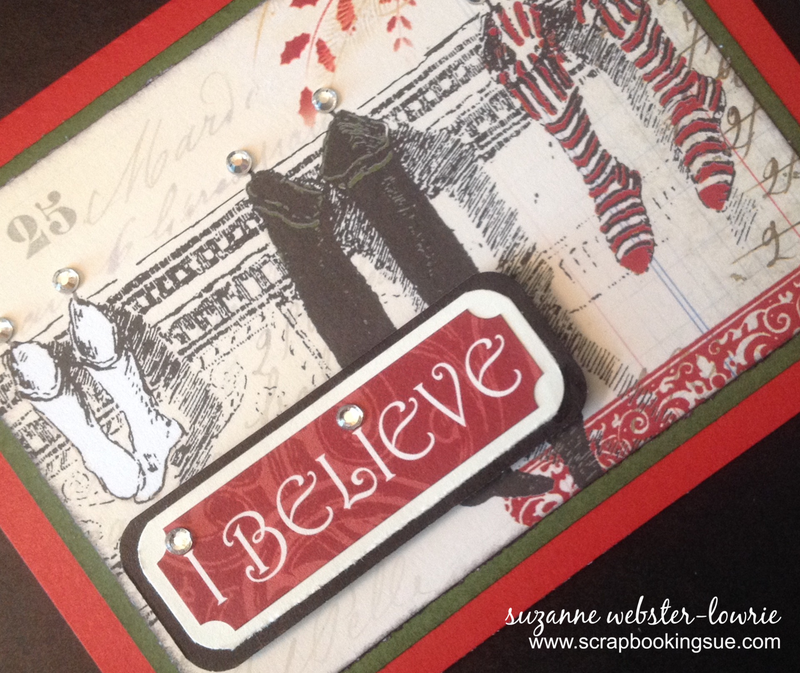 The “I Believe” sentiment was a sticker from the Yuletide Carol Complements pack, and all I did was double mount it onto cardstock; first Colonial White, and then onto Black cardstock. I rounded the corners of both cardstocks and then attached it to the card with foam tape for a bit of a 3-D pop. I went a little crazy with Clear Sparkles! If you look closely at the hanging stockings, you’ll notice that each stocking has a pretty bling hanger! I also used the sparkles to dot the “i”s in the sentiment. 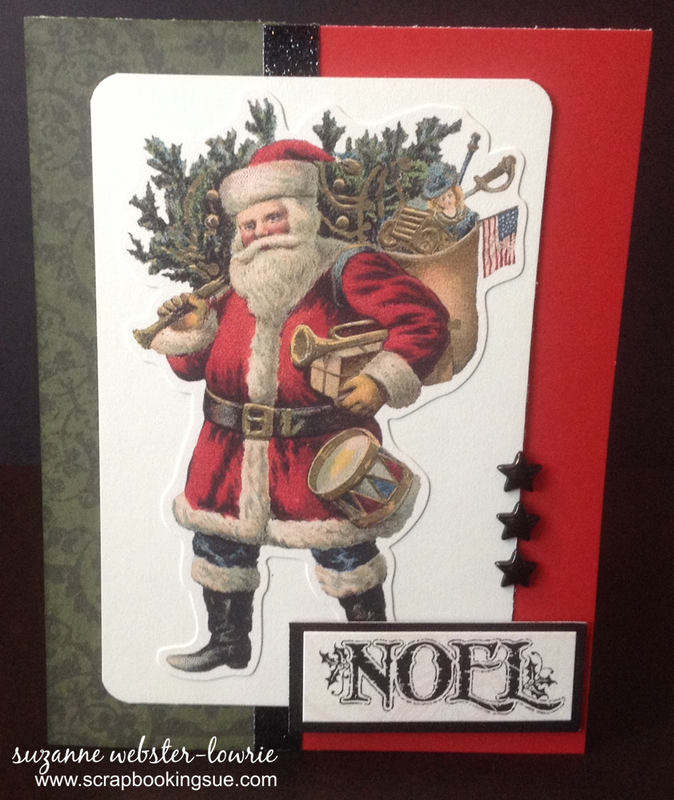 This super quick and easy Christmas card was made with paper and stickers… no stamping! Although I used some ink to distress around the edges, I didn’t use any stamps to make this card. I started with a 5.5″ x 4.25″ card base in Cranberry cardstock and layered it with patterned paper from the Yuletide Carol Paper Packet. I placed a strip of black shimmer trim vertically down the side of the card to separate the patterned paper and Cranberry paper. Then, I used the Santa image from the Yuletide Carol Complements (sticker sheet) and stuck it to a piece of Colonial White cardstock. 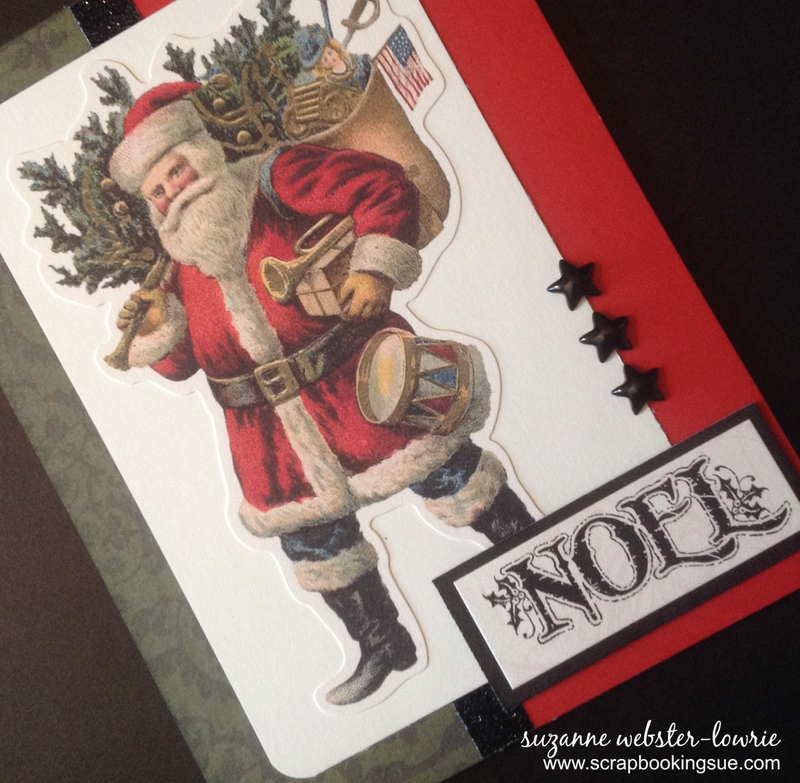 The “Noel” sentiment was also a sticker! I adhered it to a piece of black cardstock and then attached it to the card base with thin foam tape for a little bit of a pop off the card. Using some black stars that I had left from the Scaredy Cat Halloween Assortment, I placed 3 small stars down the side of the card to finish it off. A quick and easy 10 minute project! I will be linking this card to the Mojo Monday Challenge #375, found here. Welcome to Flashback Friday! If you have followed Close To My Heart for a while, then you might remember the card shown above. This card was for the very popular “Connections Club” rewards program. The front of the card was for the Consultant’s information, and the back of the card had the reward grid. Every time a purchase of $5 or more was made, customers would get their Connections Club card punched, stamped, or signed by their consultant, and be on their way to earning free product! Once $200 was spent, customers would receive an exclusive free gift from their CTMH consultant! Well, believe it or not, I still own a few brand new packages of these once sought after gifts! I have had them for sale in my Etsy Shop, for those looking for rare, exclusive, retired Close To My Heart products! In this pack, customers would receive 2 packages (in 2 different color schemes) of 6″ x 6″ exclusive vellum stickers! For more pictures and/or information, you can see them HERE in my Etsy Shop. In this pack, customers would receive 26 colored chipboard pieces. This 6.5″ x 7.25″ sheet of chipboard sentiments were once VERY popular! For more pictures and/or information, you can see them HERE in my Etsy Shop. I really miss the Connections Club Rewards Program! Did you ever receive a free item from this program?